Uniquely among the marketing mix variables, price directly affects the firm’s revenue. Thus, the setting of prices is a critical issue facing managers. Traditional economic theory argues that decision-makers are rational, and that managers will set prices to maximize the firm’s surplus. Consumers are similarly rational and will seek to maximize their surplus by purchasing more of a product or service at lower prices than they will when prices are higher. Prices in markets that approach a form of pure competition are set by a confluence of supply and demand, and firms attempt to price goods and services so that marginal revenues equal marginal costs. Yet, in the real world of marketing, there is ample evidence of the bounded rationality of marketing decision-makers who seem to set prices with things other than profit maximization in mind. Pricing strategy sometimes focuses on market share objectives, while at other times it concentrates on competitors by either seeking to cooperate with or destroy them. Frequently, pricing is about brand or product image, as marketers seek to enhance the status of a brand by concentrating on its position in the mind of the customer, rather than on volume. Likewise, customers are in reality as emotional as they are rational, and purchase brands for the status and experiences that they confer, rather than merely on the utility that they provide. From a marketing perspective, managers have tended to employ a range of pricing strategies to attain various organizational objectives. Most marketing textbooks describe the pricing of new products as high on launch and then the lowering of these prices at a later stage in order to skim the cream off the market. Or, firms attach low prices to new products right from the beginning of the life cycle, in order to ward off competition and penetrate the market. Managers have also resorted to pricing tactics such as discounting and rebates, price bundling, and psychological or odd-number pricing in order to appeal to customers. While theory suggests that customers are rational, the reality of most markets has meant that this rationality is bounded by such issues as product and information availability, the cost of search, and the inability of small customers to dictate price in any way to large suppliers. The advent of a new medium will change–is in fact already changing–the issue of price for both suppliers and customers in a way that is unprecedented. While the Internet, and its multimedia platform, the Web, have been seen by most marketers to be primarily about promotion and marketing communication, the effects that they will have on pricing will in all likelihood be far more profound. In this chapter, we explore the impact that the Web will have on both the pricing decisions that managers make, and the pricing experiences that customers will encounter. For comfortable marketers, the Web may have the most unsettling pricing implications they have yet encountered; for the adventurous, it will offer hitherto undreamed-of opportunities. For many customers, the Web will bring the freedom of the price-maker, rather than the previously entrenched servitude of the price-taker. We introduce a scheme for considering the forces that determine a customer’s value to the firm, and the nature of exchange. We use this scheme to enable the identification of forces that will affect pricing on the Web, and then suggest strategies that managers can exploit. For customers, the Web facilitates search. Search engines such as Excite, Yahoo!, and Lycos allow the surfer to seek products and services by brand from a multitude of Web sites all over the world. They are also able to hunt for information on solutions to problems from a profusion of sites, and access the opinions and experiences of their peers in different parts of the world by logging on to bulletin boards and chat rooms. The use of such agents has been touted to reduce buyers’ search costs across standard on-line storefronts, specialized on-line retailers, and on-line megastores, and to transform a diverse set of offerings into an economically efficient market. The new promise of intelligent agents (pieces of software that will search, shop, and compare prices and features on a surfer’s behalf) gives the Internet shopper further buying power and choice. The search phase in the consumer decision-making process, which can be costly and time-consuming in the real world, is reduced in terms of both time and expense in the virtual. An abundance of choice leads to customer sophistication. Customers become smarter, and exercise this choice by shopping around, making price comparisons, and seeking greatest value in a more assertive way. Marketers attempt to deal with this by innovation, but this in turn leads to imitation by competitors. Imitation leads to more oversupply in markets, which further accelerates the cycle of competitive rationality by creating more consumer choice. The Web has the potential to accelerate this cycle of competition at a rate that is unprecedented in history, creating huge pricing freedoms for customers, and substantial pricing dilemmas for marketers. There are two simple but powerful models that may enable us to gain greater insight into pricing strategies on the Web. We integrate these into a scheme that is illustrated graphically in See Customer value categories and exchange spectrum. The first of these simply applies the well-known Pareto-principle, also known as the 80-20 rule, to the customer base of any firm. For most organizations, all customers are not created equal –some are much more valuable than others. For example, one Mexican cellular phone company found that less than 10 percent of its customers accounted for around 90 percent of its sales, and that about 80 percent of customers accounted for less than 10 percent. Seen another way, while margins earned on the most valuable customers allowed the Mexican company to recoup its investment in them in a matter of months, low-value customers took more than six years to repay the firm’s investment in them. In the diagram in See Customer value categories and exchange spectrum, we have divided a firm’s customer base into four groups, which may best be understood in terms of the frequent flyer schemes run by most airlines nowadays. By far the largest group numerically, the C category customers nevertheless account for a very small percentage of an airline’s revenues and profits. These are probably customers who are not even members of the frequent flyer program, and if they are, they are likely to be blue card members who inevitably never accumulate enough air miles to be able to spend on anything. They are unlikely to be loyal customers; they don’t fly often, and when they do, their main consideration is the ticket price. For the sake of a few dollars, euros, or yen, they will happily switch airlines and fly on less than convenient schedules. Category B customers are like the silver card frequent flyers of an airline. They fly more frequently than Cs, and may even accumulate enough miles or points to claim rewards. However, they are still likely to be price sensitive, and exhibit signs of promiscuity by shopping around for the cheapest fares. The A category customers represent great value to the firm–in airline terms these are gold card holders. They use the product or service very frequently, and are probably so loyal to the firm that they do not shop around for price, even when there may be significant differences between suppliers. Because they represent substantial value to a firm such as an airline, they may be rewarded not only with miles, but special treatment, such as upgrades, preferential seating, and the use of lounges. Finally, the A category of customers represents a very small, but very valuable, group who account for a disproportionately large contribution to revenues and profits. Not only do these customers reap the rewards of value and loyalty, they are probably known by name to the firm, which inevitably performs service beyond the normal for them. An unsubstantiated but persistent rumor has it that there is a small handful of British Airways customers for whom the airline will even delay the Concord! 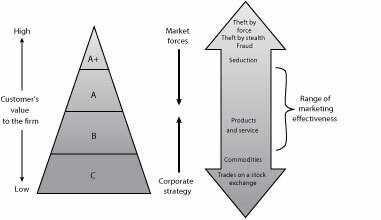 The second model in Exhibit 1 is derived from Deighton and Grayson’s (1995) notion of a spectrum of exchange based on the extent to which an exchange between actors is voluntary. Thus, at one extreme, exchange between actors can be seen as extremely involuntary, as in the case of theft by force. At least one party to this type of exchange does not wish to participate, but is forced to by the other’s actions. At the other extreme, an example of an extremely voluntary form of exchange would be the trading of stocks or shares by two traders on a stock exchange trading floor. This type of exchange is unambiguously fair , with no need for inducement for either party to act. Here, both actors participate entirely voluntarily for mutual gain–neither is able to buy or sell better shares or stocks at a price. Indeed, economists would argue that this bilateral exchange is the closest approximation to pure competition in the microeconomic sense. The two fully informed parties believe that each will be better off after the exchange. The market is highly efficient if price itself contains all the information that the parties need to make their decisions. Market efficiency is the percentage of maximum total surplus extracted in a market. In competitive price theory, the predicted market efficiency is 100 percent where the trading maximizes all possible gains of buyers and sellers from the exchange. Returning once more to the other end of the spectrum, the next least voluntary form of exchange between actors is theft by stealth, where one actor appropriates the possessions of the other without the other’s knowledge. This follows on to the next point of fraud, where one party to the exchange enters into a transaction with the other in such a way that he or she is deliberately deceived, tricked, or cheated into giving up possessions without receiving the expected payment in return. Back on the other extreme of the spectrum, there are commodity exchanges, where actors buy and sell commodities such as gold, oil, copper, grain, and pork bellies. There is little or no difference between the product of one supplier and another–gold is gold is gold, commodities are commodities. The price of the commodity contains sufficient information for the parties to decide whether they will transact, and one seller’s commodity is exactly the same as another’s. Between the extremes of the spectrum there is a gray area, which we label a range of marketing effectiveness . Adjacent to fraud there is what Deighton and Grayson refer to as seduction , which is an interaction between marketer and consumer that transforms the consumer’s initial resistance to a course of action into willing, even avid, compliance. Seduction induces consumers to enjoy things they did not intend to enjoy, because the marketer entices the consumer to abandon one set of social agreements and collaborate in the forging of another. Second, and next to commodities, there is the vast array of products and services purchased and consumed by customers. While the customer may in many cases be seduced into purchasing these, frequently some of these products and services bear many of the characteristics of commodities. In a differentiated market, products vary in terms of quality or cater to different consumer preferences, but frequently the only real differences between them may be a brand name, packaging, formulation, or the service attached to them. Where does marketing, as we know it, work best along this spectrum of exchange? The answer is, in a narrow band, labeled the range of marketing effectiveness; straddling most products and services, and extending from somewhere near the middle of seduction, to somewhere near the near edge of commodities. Here, the parties are not equally informed. There is information asymmetry, and the merit of the transaction being more or less certain for one than the other. Marketing induces customers to exchange by selling, informing or making promises to them. Obviously, activities such as theft by force or stealth, and also fraud, cannot be seen as marketing. Yet, marketing is also unnecessary, or at best perfunctory, at the other end of the spectrum. Two traders on a stock exchange floor can hardly be said to market to each other when they trade bundles of stocks or shares. The price contains all the information the parties to the transaction need to do the deal. The market is simply too efficient in these areas for marketing to work well–almost paradoxically, it is true to say that marketing is not effective when markets are efficient. migrate as many customers upward as possible. That is, to turn C customers into Bs, Bs into As, and so forth. By doing this, the firm will increase its customer equity, or in simple terms, maximize the value of its customer transaction base. force the customer distribution down, turning As to Bs, and Bs to Cs. moving products or services away from the zone of commodities, and more to the location of seduction. commoditization, a process by which the complex and the difficult become simple and easy–so simple and easy that anybody can do them, and does. Commoditization is a natural outcome of competition and technological advance, people learn better ways to make things and how to do so cheaper and faster. Prices plunge and essential differences vanish. Cheap PCs and mass-market consumer electronics are obvious examples of this. It is thus incumbent upon managers to understand the forces that may impel markets towards a preponderance of C customers, and products and services towards commodities. Technology is manifesting itself in many such effects, and the Web is an incubator at present. On a more positive note, technology also offers managers some exciting tools with which to overcome the effects of market efficiency and with which to halt, or at least decelerate, the inevitable degradation of the customer base. These are the issues that are now addressed. While firms attempt to migrate customers upward in terms of customer value, and to broaden the range of marketing effectiveness on the spectrum of exchange, there are forces at work in the market that mitigate in the opposite direction. While these forces occur naturally in most markets, the effect of information technology has been to put them into overdrive. These forces are now discussed. Information search by customers is a fundamental step in all models of consumer and industrial buying behavior. Search is not without sacrifice in terms of money, and especially, time. A number of new technologies are emerging on the Internet that greatly facilitate searching. These vary in terms of their ability to search effectively, and also with regard to what they achieve for the searcher. Of course, some are well along the road to full development and implementation, and others are still on drawing boards. The tools also range from a simple facilitation of search, through more advanced proactive seeking, to the actual negotiation of deals on the customer’s behalf. However, all hold significant promise. These tools are described briefly in Exhibit 2. Search engine Software that searches Web sites by key word(s). AltaVista and Hotbot. Directory A Web site containing a hierarchically structured directory of Web sites. Yahoo! Comparison site A Web site that enables comparisons of product/ service category by attributes and price. CompareNet, a Web site that lists comparative product information and prices. Shopbot A program that shops the Web on the customer’s behalf and locates the best price for the sought product. Bots used by search engines Lycos and Excite. Intelligent agent A software agent that will seek out prices and features and negotiate on price for a purchase. Kasbah, a bot being developed by MIT, can negotiate based on the price and time constraints provided. At the very least, tools in Exhibit 2, such as search engines, directories, and comparison sites can reduce the customer’s costs of finding potential suppliers, and those of making product and price comparisons. More significantly, the more sophisticated tools, such as true bots and agents, will seek out lowest prices and even conduct negotiations for lower prices. Nobel prize winner in economics, Ronald Coase, introduced the notion of transaction costs to the economics literature. Transaction costs are a set of inefficiencies that should be added to the price of a product or service in order to measure the performance of the market relative to the non-market behavior in firms. Of course, there are also transaction costs to buyers, including consumers. The different types of transaction costs, examples of these for customers, and how the Web may reduce them are illustrated in Exhibit 3. Obviously, some of these transaction cost reductions are real and monetary; in other cases, they may be more psychic in nature–such as the relating of poor service over the Internet on bulletin boards as a form of customer revenge (and this in turn can reduce transaction costs for other customers). Information costs (learning) A prospective customer wishes to learn more about digital cameras and what is available. Previously, she would have had to read magazines, talk to knowledgeable individuals, and visit stores. She can now access firm and product information easily and at no cost, obtain comparative product information, and access suppliers on the Web. Bargaining costs (transacting, communicating, negotiating) The time normally taken by a customer to negotiate can now be used for other purposes, as intelligent agents transact and negotiate on the customer’s behalf.On-line bidding systems can achieve similar results. For example, GE in 1996 purchased USD 1 billion from 1,400 suppliers, and there is evidence of a substantial increase since. Significantly, the bidding process for the firm has been cut from 21 days to 10. Decision costs The cost of deciding over Supplier A vs. Supplier B, or Product A vs. Product B. The Web makes information available on suppliers (on their or comparative Web sites) and products and services. For example, Travel Web allows customers to compare hotels and destinations on-line. Policing costs (monitoring cheating) Previously, customers had to wait to receive statements and accounts, and then to check paper statements for correctness. On-line banking enables customers to check statements in real time. Chat lines frequently alert participants to good and bad buys, and potential product and supplier problems (e.g., the flaw in Intel’s Pentium chip was communicated extensively over the Internet). Enforcement costs (remedying) When a problem exists with a supplier, how does the customer enforce contractual rights? In the non-Web world, this might require legal assistance. Publicizing the infringement of one’s rights would be difficult and expensive. Chat lines and bulletin boards offer inexpensive revenge, if not monetary reimbursement! Particularly in consumer markets, suppliers tend to make prices while customers take them. A notable exception would be auctions, but the proportion of consumer goods purchased in this way has always been very small, and has been mainly devoted to used goods. There are a number of instances on the Web where the opposite situation is now occurring. On-line auctions allow cybershoppers to bid on a vast range of products, and also services such as airline tickets, hotel room, and tickets. Already, many are finding bargains at the hundreds of on-line auction sites that have cropped up. Onsale.com is a huge auction Web site that runs seven live auctions a week, where people outbid one another for computer gear and electronics equipment. Onsale buys surplus or distressed goods from companies at fire sale prices so they can weather low bids. At a higher level of customer price making, Priceline.com invites customers to name their price on products and services ranging from airline tickets to hotel rooms, and new cars to home mortgages. In the case of airline tickets, for example, customers name the price they are willing to pay for a ticket to a destination, and provide credit card details to establish good faith. Priceline then contacts airlines electronically to see if the fare can be obtained at the named price or lower, and undertakes to return to the customer within an hour. Priceline’s margin is the differential between the customer’s offer price and the fare charged by the airline. Caterpillar uses its Web site to invite bids on parts from preapproved suppliers. Suppliers bid on-line over a specified period and a contract is awarded to the lowest bidder. Negotiation time is reduced and average savings on purchases are now 6 percent. In this way, the customer has taken almost total control of the transaction, for it has become difficult for suppliers to compete on anything but price. There is little opportunity to differentiate products, engage in personal selling, or to add service, as traditional marketing strategy would suggest suppliers do. In pre-mass market times, buyers and sellers negotiated individually over the sale of many items. It is possible that markets can move full circle, as buyers and sellers do battle in the electronic world. The struggle should result in prices that more closely reflect their true market value. We will see more one-on-one negotiation between buyers and sellers. As negotiation costs decrease significantly, it might be practical to have competitive bidding on a huge range of purchases, with a computer bidding against another computer on behalf of buyers and sellers. The first goods to be bartered in electronic markets have been commodities. Price rather than product attributes, good selling, or warm advertising, is the determining factor in a sale. When the commodity happens to be perishable–such as airline seats, oranges, or electricity–the Web is even more compelling. Suppliers have to get rid of their inventory fast or lose the sale. The problem on the Web is that when customers can easily compare prices and features, commoditization can also happen to some high-margin products. Strong brand names alone may not be enough to maintain premium prices. In many cases, branded products may even prove to be interchangeable. While customers may not trust a new credit card company that suddenly appears on the Web because they do not know its name, they may easily switch between Amex and Diners Club, or Visa and MasterCard. It is possible that a marketer considering the forces discussed above may become pessimistic about the future of marketing strategy, especially concerning the flexibility of pricing possibilities. Yet, we contend that all is not doom and gloom, and that there are strategies which managers may exploit that will allow them to migrate customers up the Pareto pyramid, and which will make marketing more effective in a time of market efficiency. These strategies are now discussed. The information age, and the advent of computer-controlled machine tools, lets consumers have it both ways: customized and cheap, automated and personal. This deindustrialization of consumer-driven economics has been termed mass customization. The Web has already been an outstanding vehicle for mass customization, with personalized news services such as CNN and Pointcast, personalized search engines such as My Yahoo!, and the highly customized customer interaction pages of on-line stores such as Amazon.com. However, the Web also gives marketers the opportunity to exploit a phenomenon that service providers such as airlines have long known, the same product or service can have different values to different customers. Airlines know that the Friday afternoon seat is more valuable to the business travelers, and charge them accordingly. The Web should allow the ultimate in price differentiation–by customizing the interaction with the customer, the price can also be differentiated to the ultimate extent, so that no two customers pay the same price. Technology allows sellers to collect detailed data about customers’ buying habits, preferences, even spending limits, so they can tailor their products and prices to the individual buyer. Customers like this because it recognizes them as individuals and serves them better–recommends books that match their preferences, rather than some critic’s; advises on music that matches their likes, rather than the top twenty; and puts them in touch with people or jobs that match them, rather than a list of names or an address list of employers. This, in turn, creates switching barriers for customers that competitors will find difficult to overcome by mere price alone. While the customer may be able to purchase the product or service at a lower price on another Web site, that site will not have taken the time or effort to learn about the customer, and so will not be able to serve the customer as well. In terms of economics, the customer will not actually be purchasing the same item. Most firms have resorted to menu or list pricing systems in the past to simplify the many problems that are caused by attempting to keep prices recorded and up-to-date. Pricing is not just about the Web–within firms, there can be private networks or extranets (see ), that link them with their suppliers and customers. Extranets make it possible to get a precise handle on inventory, costs, and demand at any given moment, and adjust prices instantly. Without automation, there is a significant cost associated with changing prices, known as the menu cost . For firms with large product or service lines, it used to take months for price adjustments to filter down to distributors, retailers, and salespeople. Streamlined networks reduce menu cost and time to near zero, so there is no longer a really good excuse for not changing prices when they need to be changed. The more like a commodity a product or service becomes, the easier it is for customers to make price comparisons and to buy on price alone. Marketers have attempted to overcome this in the past by differentiating products by enhancing quality, adding features, and branding. When products reached a phase of parity, marketers entered the age of service, and differentiated on the basis of customer service. However, in an era of increasing service parity, it is the staging of customer experiences that may be the ultimate and enduring differentiator. The Web provides a great theater for the staging of unique personal experiences, whether esthetic, entertaining, educational, or escapist, and for which customers will be willing to pay. Marketers will make a big mistake by assuming that customers will expect and want to pay less on the Web than they do in conventional channels. Indeed, managers in many industries have a long record of assuming that customers underestimate the value of a product or service to them, and would typically pay less for it if given the chance. There is a very successful restaurant in London that invites customers to pay for a meal what they think it is worth. Some exploit the system and eat for free; however, on average, customers pay prices that give the establishment a handsome margin. The purchase price is one element of the total cost of acquiring a product or service. Searching, shipping, and holding costs, for instance, can contribute substantially to the acquisition cost of some products. In those circumstances, where Web-based purchasing enables a customer to reduce the total cost of a purchase, that person may be willing to pay more than through a traditional channel. This argument can be formulated mathematically. then T = P O. 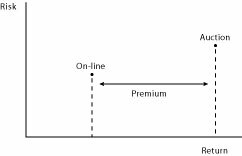 Furthermore, consumers should be willing to pay a premium of δ = Pw – Pt where δ < Ot – Ow . For industrial buyers, opportunity costs may be a significant component of the total costs of a purchase. Also, particularly busy consumers will recognize the convenience of Web purchasing. Both of these groups are likely to be willing to pay a premium price for products purchased via the Web, if the result is a reduction in the total purchase cost. As a general pricing strategy, Web-based merchants should aim to reduce customers’ Ot so they can raise Pw to just below the point where Tw = Tt. The Web creates new ways for sellers to reduce the total costs that are faced by purchasers. Sellers can capitalize on these cost reductions by charging higher prices than those that are charged in traditional outlets. Many firms, particularly those in business-to-business markets, may find it more effective to barter rather than sell when prices are low. A number of electronic exchanges have already been successfully established to enable firms to barter excess supplies of components or products that would have otherwise been sold for really low prices. In this way, the firm rids itself of excess stock and receives value in exchange, in excess of the price that would have been realized. For example, Chicago-based FastParts Inc. and FairMarket Inc. in Woburn, Massachusetts, operate thriving exchanges where computer electronics companies swap excess parts. Many managers overlook a basic economic opportunity. In many instances, it is better to maximize revenue rather than price. Airlines have perfected the science of yield management, concocting complicated pricing schemes that not only defy customer comparison, but that also permit revenue maximization on a flight, despite the fact that the average fare might be lower. Many airlines are now using Web sites to sell tickets on slow-to-fill or ready-to-leave flights, either on specials, or on ticket auctions. They also make use of external services, such as Priceline.com, wherein the customer, in a real sense, creates an option (the right, but not the obligation to sell a ticket), to both discern market conditions, and to sell last-minute capacity. Apart from their Web sites, airlines, hotels, and theaters can also use sites such as lastminute.com to market seats, rooms, and tickets a day or two before due date. Every purchase incorporates an element of risk, and basic finance proclaims that risk and return are directly related. Thus, consumers may be willing to pay a higher price if they can lower the risk of their transaction. Consider the case of auto dealers who can either buy a used car at an auto auction or purchase on-line via the Web. With on-line buying, it is possible for dealers to reduce their risk. Dealers can treat the on-line system as part of their inventory and sell cars off this virtual lot. The dealer can buy cars as needed to meet customer demand. In the best case scenario, a buyer requests a particular model, the dealer checks the Web site, puts a hold on a particular car, negotiates the price with the buyer, and then buys the car from the Web. In effect, the dealer sells the car before buying it. In this case, the dealer avoids the risks associated with buying a car in anticipation of finding a customer. Dealers can be expected to pay a premium when the risk of the transaction is reduced. As Exhibit 4 illustrates, some dealers may perceive buying a car at an auction as higher risk, and thus expect a higher return compared to buying on-line. The difference in the return is the premium that a dealer will be willing to pay for a car purchased on-line, all other things being equal. Web-based merchants who can reduce the buyer’s risk should be able to command a higher price for their product. Typical methods for reducing risk include higher quality and more timely information, and reducing the length of the buy and resell cycle. This risk effect that we describe should be equally applicable to both organizational buyers and individual consumers. Again, the Web creates a special opportunity for sellers to reduce the risks that buyers face. In turn, sellers can charge a higher price to buyers for this benefit (risk reduction), which has been created on-line. The Internet and the World Wide Web will have a fundamental influence on the pricing strategy of firms. Similarly, the technology will open many doors to buyers hitherto closed by the effects of time, cost, and effort. In this chapter, we have illustrated the effects of the new technology on price from two perspectives. First, the technology has the potential to change the shape and structure of the firm’s customer base. At worst, it will flatten the customer base, turning the majority of a firm’s customers into transactional traders who buy the spot. However, used wisely, it has the potential for migrating a significant number of a firm’s customers up the value triangle, narrowing the customer base, and enabling the firm to build relationships with customers that negate the impact of mere price alone. Second, the new media has the potential to move customers along the exchange spectrum in ways, and at rates, that have not hitherto been experienced. Technology may combine with market forces to reduce the vast majority of a firm’s transactions to the level of commodity trades, leaving managers with little opportunity to make prices. A far more optimistic scenario, however, sees managers using the technology in combination with other marketing strategies to seduce the customer into a mutually valuable relationship. The chapter identifies the effects of technology and the forces in the market that have the potential to flatten and homogenize customer base triangles and shift customers disproportionately towards the commodity end of the exchange spectrum. The chapter also finds a number of approaches available to managers to put the brakes on these processes, and indeed, use the new technology to accelerate more effective pricing strategy. Marketers have always viewed price as one of the instruments of policy in the marketing mix–a variable which, theoretically at least, can be manipulated and controlled according to circumstances in the business environment and the nature of the target market. In practice, however, many pricing decisions are not taken by marketers, and are based more on issues such as cost and competition than any notion of customer demand. Seen pessimistically, price decision making has been, and may continue to be, a mechanistic process of calculating costs and attempting markups, or a knee jerk reaction to market conditions and competitive behavior. A more optimistic view might be that pricing decisions can be as creative as those taken with regard to the development of new products and services, or the development of advertising campaigns. Indeed, pricing may be the last frontier for marketing creativity. Ignored or utilized mechanically, the Internet and the Web may be the vehicles that destroy the last vestiges of managerial pricing discretion. In the hands of the wise, these vehicles may be the digital wagons that carry pricing pioneers to the edge of the cyber frontier. McKeown, P. G., and R. T. Watson. Manheim Online . Terry College, University of Georgia, Contact rwatson@uga.edu for a copy. Bakos, J. Y. 1997. Reducing buyer search costs: implications for electronic marketplaces. Management Science 43 (12):1676-1692. Cortese, A. E., and M. Stepanek. 1998. Good-bye to fixed pricing. Business Week , May 4, 71-84. Deighton, J., and K. Grayson. 1995. Marketing and seduction: building exchange relationships by managing social consensus. Journal of Consumer Research 21 (4):660-676. Desiraju, R., and S. M. Shugan. 1999. Strategic service pricing and yield management,. Journal of Marketing 63 (1):44-56. Malone, T. W., J. Yates, and R. I. Benjamin. 1989. The logic of electronic markets. Harvard Business Review 67 (3):166-170. Pine, B. J., B. Victor, and A. C. Boynton. 1993. Making mass customization work. Harvard Business Review 71 (5):108-119. Pine, B. J., III, and J. H. Gilmore. 1998. Welcome to the experience economy. Harvard Business Review 76 (4):97-105. Pricing by Leyland F. Pitt (Simon Fraser University, Canada) is licensed under a Creative Commons Attribution 4.0 International License, except where otherwise noted.